Globcal International selected Belize to establish an international foundation because it offers the best accommodations for our special global work, plus the official language is English. They offer the most flexible international business law, respect private international law, are well-adapted to a tourism based economy, they offer offshore investments, anyone from any nation may own property here, and Belize is a member of the United Nations and Non-Aligned Movement (politically neutral states). 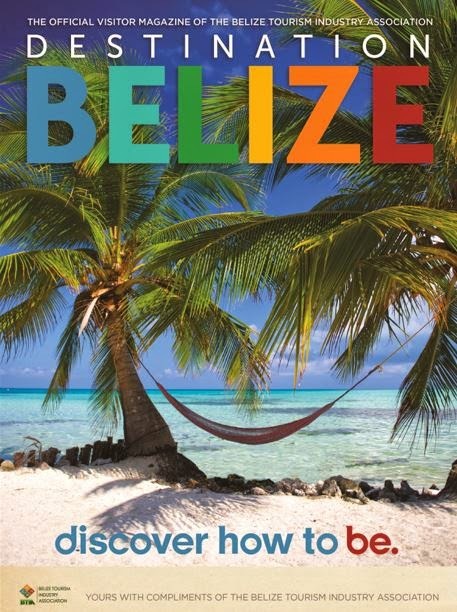 Everyone loves Belize, now we do too, perhaps now more than some, for lots of reasons! Belize (before 1973 British Honduras) is a picturesque country that has an unspoiled environment, with barrier reefs, woodland, caves, rivers, mountains, waterfalls and jungle. It is located in Central America in the south-eastern part of the Yucatan Peninsula. Its shores are washed by the Caribbean Sea. The area of the country is approximately 23,000 sq. km, and it is bounded by Mexico to the north and Guatemala to the west and south. The administrative capital is Belmopan, but the major commercial centre is Belize City, situated on the east coast close to the major International airport. Less than 2 hours from Miami and only 4.5 hours from Los Angeles. The total population of Belize is about 300,000, of which about a third lives in Belize City. Much of the country’s population is ethnically diverse and includes descendants of the original Mayan culture, as well as people of Caribbean, Caucasian, Chinese and East Indian descent. Over 50 per cent of the population is urban. English is the official language although Spanish, Creole, Garifuna and Mayan are widely spoken throughout the country. Belize became a British Crown Colony in 1871 and achieved complete self-rule in 1981. Since that time it has enjoyed stable and democratic Government. Now Belize is an independent democratic Commonwealth country. Government policy is set by the Cabinet, under the leadership of the Prime Minister. The Cabinet is made up of the Prime Minister and Ministers appointed by him from an elected 29-member House of Representatives, and the 12-member Senate. Belize is also a member of the United Nations and the Non-Aligned Movement. There are two main political parties, both of which encourage the economic development of the country and overseas investment. The type of law is Common Law, based on English Common Law. Legislation is modelled on the earlier British Virgin Islands legislation. Belize’s main income is from tourism. There are forest reserves, wildlife sanctuaries, marine resort areas, the world’s only jaguar reserve, as well as Mayan archaeological sites that are a magnet for tourists from all over the world. The major exports are sugar cane, bananas, fruit juices, canned fish, garments and timber and wood products. The offshore finance industry is generating an increasing proportion of national income. The currency used is the Belize Dollar (BZ$). Offshore activities are exempted from exchange control. The second through fourth sections were copied and pasted from a publication of Company Express, a legal firm in London, called Jurisdiction of the Month: Belize. They go on to discuss Belize IBCs and offshore incorporation in Belize based on the 1990 law. Our enchantment is with what we learned we could accomplish in Belize that can help humanity and the environment through philanthropy, charity, and prosperity making it a foundation state. Belize has a new law from 2010 for the establishment of International Foundations and International Charitable Foundations. 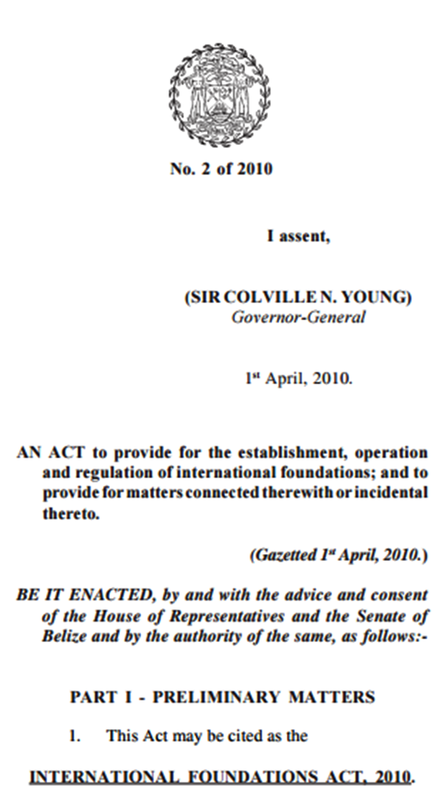 The Belize government under Sir Colville N. Young, Governor General of HRM Queen Elizabeth the Second, established a new Act to provide for the establishment, operation and regulation of international foundations; it is called the "International Foundations Act, 2010" it includes revisions in 2013. The benefits of establishing an international foundation are extraordinary and you can also establish an international charitable foundation which interested us a bit more. As a charity one guarantees that at least 10% of the foundation is permanently administered in Belize in social programs, this is a very fair trade-off and will help Belize develop sustainably over the coming years if enough organizations establish foundations as a result of this "moderately recent" new law. International charitable foundations are considered non-governmental organizations too, and are not subject to national taxes, local taxes, or customs duties on imports. The civil status of a respectable charitable foundation is preferable and more integral to that of a minor state diplomat, a church, or a religious institution. There are many benefits to establishing a foundation in Belize especially if you have funds that you want to reserve for a more global purpose or more funds than you want to share with your state. International investors know that once they pay their taxes on their income they should not have to pay tax on it again, so they don't if they invest it offshore. The great thing with a foundation is you can invest and still enjoy its benefit with a tax-exempt international foundation. The popular trend may become the establishment of personal foundations (in someone's name) for literally hundreds or any purpose, those who are truly benevolent will see the 10% permanent investment in programs and services that benefit Belize such as managed educational training, sustainable energy development, and other capital sustainable programs will serve them better than a private foundation, either are just as good. It makes good business sense especially if you are involved in international fundraising. Globcal International in setting up our organization decided we should share this information and assist others in becoming more involved in globalization for good. Who can Establish a Foundation? You must be an international, you may not currently be a Belizean national or a permanent resident here as the founder of a Belize International Foundation (you do not even have to visit). The founder can come and go to the foundation as its guest; but may not take up permanent-residence or become a citizen in Belize, unless honorarily or through a separate petition following the foundation. You may be a tourist, temporary resident, investor, business person, diplomat, special visitor, or natural person from any of the United Nations member states with a valid passport. You must invest in a permanent endowment (usually a piece of land or a fund) to serve as the foundation base itself. You will need to create a foundation charter stating the purposes, make registration, assign a protector who in turn shall be in charge of finding a registered agent, and employ a secretary. The legal character of the international foundation is civil incorporation with offshore designation and powers that can only be compared to a great foundation ship at sea. All international investment should be in currency (as stated in Belize Law, US Dollars) foundations may not source their funds from Belizeans or predominantly from any of its immediate neighbor states. The value of an endowment is generally accepted as being $100,000 USD, but in Belize the minimum founder's endowment can be as low as $10,000 USD to establish a foundation. Currently there are lots of rain forest tracts of 100-1000 acres or more, that could be purchased as a conservation interest foundation development of Belize, then it can be used for carbon-offsets, biodiversity, and ecotourism as well, to produce ecosystem services. All excellent modern sustainability investments. Globcal International learned about international foundations and charitable foundations by establishing a presence in Belize with the initiative to develop a cooperative international development foundation, so here we are as the "new top experts and practitioners" with a global network made up of goodwill ambassadors living all around the world, we have local attorneys that can have your foundation established in several days. We are also offering private individuals the opportunity to participate in group foundations with smaller investments. Really few people have taken advantage of this special opportunity, we hope you do. It will mean a better Belize and also help people become sustainable all around the world. Find me here in Belize! If you need help or want to join in the founding of a collective foundation perhaps a rainforest, ecovillage, or a tourist resort, here I am at the center of all the activity and your author, Ambassador Col. David Wright, Globcal International Commissioner and Goodwill Ambassador. Get involved now with Globcal International in time for the founding of the Goodwill Ambassadors Foundation here in Belize, your involvement will earn you special privileges here in Belize and elsewhere in the world. Learn more by contacting me for details david@globcal.net .